The dinar (Cyrillic script: динар) was the currency of the three Yugoslav states: the Kingdom of Yugoslavia (formerly the Kingdom of Serbs, Croats and Slovenes), the Socialist Federal Republic of Yugoslavia, and the Federal Republic of Yugoslavia between 1918 and 2006. The dinar was subdivided into 100 para (Cyrillic script: пара). In the early 1990s, there was severe and prolonged hyperinflation due to a combination of economic mismanagement and criminality. Massive amounts of money were printed; coins became redundant; inflation rates reached the equivalent of 7029851000000000000♠8.51×1029% per year. The highest denomination banknote was 500 billion dinars; it was worthless a fortnight after it was printed. This hyperinflation caused five revaluations between 1990 and 1994; in total there were eight distinct dinari. Six of the eight have been given distinguishing names and separate ISO 4217 codes. National Bank of the Kingdom of Serbs, Croats & Slovenes, 10 Dinara (1920). Engraved and printed by the American Bank Note Company, Allegory "Progress" engraved by Robert Savage. Until 1918, the dinar was the currency of Serbia. It then became the currency of the Kingdom of Serbs, Croats and Slovenes, circulating alongside the krone in Croatia, Slovenia and Bosnia and Herzegovina, with 1 dinar = 4 kronen. The first coins and banknotes bearing the name of the Kingdom of Serbs, Croats and Slovenes were issued in 1920, until which time Serbian coins and banknotes circulated. In 1929, the name of the country changed to the Kingdom of Yugoslavia and this was reflected on the currency. In 1931, an exchange rate of 56.4 dinara to the U.S. dollar was set, which changed to 44 dinara in 1933. In 1937, a tourist exchange rate of 250 dinara to the British pound was established. In 1941, Yugoslavia was invaded and split up, with the dinar remaining currency in Nedić's Serbia as Serbian dinar). The kuna was introduced in Croatia and Bosnia and Herzegovina (Independent State of Croatia) at par with the dinar, whilst the Bulgarian lev, Italian lira and German Reichsmark circulated in those part of Yugoslavia occupied by these countries. In 1944, as Yugoslavia began to be reconstituted, the Yugoslav dinar replaced the Serbian dinar, Independent State of Croatia kuna and other occupation currencies, with the rates of exchanged being 1 Yugoslav dinar = 20 Serbian dinara = 40 kuna. In May 1945, a peg of 50 dinara = 1 U.S. dollar was established but was not maintained. On January 1, 1966, the first of five revaluations took place, at a ratio of 100 to 1. This currency was never very stable, suffering from an inflation rate of 15 to 25 percent per year. In the late 1980s the inflation rate accelerated, causing the currency to be revalued at the beginning of 1990. Coat of arms of the Socialist Federal Republic of Yugoslavia. The second revaluation took place on January 1, 1990, at a ratio of 10,000 to 1. During this period, the constituent republics began to leave the Socialist Federal Republic of Yugoslavia. Four of the six republics declared independence and issued their own currencies shortly after. This was the last dinar that bore the coat of arms and the name of the "Socialist Federal Republic of Yugoslavia" in multiple languages. Serbian enclaves in Croatia and Bosnia and Herzegovina also issued currencies in dinar, equivalent to and revalued together with the Yugoslav dinar. These were the Krajina dinar and the Republika Srpska dinar. Yugoslavia re-denominated the dinar for the fourth time on 1 October 1993, at a ratio of 1 million to 1. This did not mitigate the hyperinflation, and the 1993 dinar (ISO 4217 code: YUO) lasted for only three months. Coinage became redundant. The 1993 dinar had the largest denomination out of all incarnations of Yugoslavian currency: the banknote, featuring Jovan Jovanović Zmaj had a face value of 500 billion (7011500000000000000♠5×1011) dinara (right). Wages became worthless; if paid in cash, workers had to rush out and spend their wages before they lost their value overnight. Many businesses started to pay wages in goods instead, and a simple barter system developed. Businesses with good connections to politicians could still get access to hard currency. Some shops, instead of rewriting their prices several times a day, started pricing goods in "bods" (points), often equivalent to hard currency such as one Deutschmark. The winter of 1993 was particularly hard for pensioners; if a monthly pension was spent immediately, it was still barely enough to buy three litres of milk. Many people relied on connections to friends and family abroad (who could provide hard currency) or in the countryside (who could grow food). Yugoslavia re-denominated the dinar for the fifth time on 1 January 1994, at a ratio of 1 billion (7009100000000000000♠109) to 1. The 1994 dinar (ISO 4217 code: YUG) was the shortest-lived out of all incarnations of Yugoslavian currency, as hyperinflation continued to intensify , and only one coin (1 dinar) was issued for it. Towards the end of the 1994 dinar, the National Bank overprinted and reissued 10 million dinara banknotes from the 1992 dinar (right). On 24 January 1994, the novi dinar (nominative plural: novi dinari, Cyrillic script: нови динар, нови динари; genitive plural: novih dinara, Cyrillic: нових динара; novi means new) was introduced. This was not a revaluation of the dinar. Instead, the novi dinar was pegged at par to the Deutsche Mark. On the day of the introduction of the novi dinar, the exchange rate of the previous dinar to the Deutsche Mark, and, hence, to the novi dinar, was approximately 1 DM = 13 million dinara. Despite not being pegged to the newest currency, the previous dinar did not fall further in value, remaining at about 12 million "1994" dinar to the novi dinar. The overall impact of the hyperinflation was that 1 novi dinar equalled approximately 1.2×1027 third (hard) dinara from before 1990, 1.2×1029 Federation dinara, or 2.4 ×1030 pre-war dinara. The "novi" portion of the name was abandoned in 2000. On 6 November 1999, Montenegro decided that, besides the Yugoslav dinar, the Deutsche Mark would also be an official currency. On November 13, 2000, the dinar was dropped and the Deutsche Mark (by that time defined in terms of the euro) became the only currency. 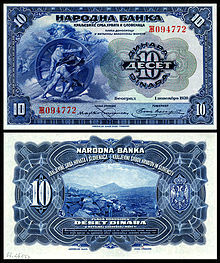 In 2006, the end of Yugoslavia, following Montenegro's independence declaration led to the dinar, by then only used in Serbia, being replaced by the Serbian dinar. In 1920, the first coins were minted in the name of the Kingdom of Serbs, Croats and Slovenes. They were zinc 5 and 10 para and nickel-bronze 25 para. These were followed, in 1925, by nickel-bronze 50 para, 1 and 2 dinara. From 1931, coins were minted in the name of Yugoslavia, starting with silver 10 and 20 dinara, followed by silver 50 dinara in 1932. In 1938, aluminium-bronze 50 para, 1 and 2 dinara, nickel 10 dinara and reduced size, silver 20 and 50 dinara were introduced. These were the last coins issued before the Second World War. In 1945, zinc 50 para, 1, 2 and 5 dinara were introduced, followed in 1953 by aluminium coins for the same denominations. In 1955, aluminium-bronze 10, 20 and 50 dinara were added. In 1966, brass 5, 10, 20 and 50 para, and cupro-nickel 1 dinar coins (dated 1965) were introduced. In 1971, nickel-brass 2 and 5 dinara were introduced, followed by cupro-nickel 10 dinara in 1976. Production of 5, 10 and 20 para coins ceased in 1981, with bronze 25 and 50 para being introduced the following year. Nickel-brass 20, 50 and 100 dinara were introduced in 1985 and production of all coins less than 10 dinara stopped the next year. In 1988, brass 10, 20, 50 and 100 dinara were introduced. These four coins were issued until 1989. In 1990, coins for 10, 20 and 50 para, 1, 2 and 5 dinara were introduced. The highest two denominations were minted in small numbers in 1992, the other denominations having ceased production in 1991. Coins were issued for this currency in 1992 in denominations of 1, 2, 5, 10 and 50 dinara. The 1, 2 and 5 dinara were bronze, whilst the 10 and 50 dinara were nickel-brass. The coins bore the state title "Yugoslavia" (Jugoslavija in the Latin alphabet and Југославија in Cyrillic) in its simplest form without any modifier. Coins were issued in 1993 in denominations of 1, 2, 5, 10 and 50 dinara struck in nickel-brass, and 100 dinara struck in brass. Brass 500 dinara coins were also struck but not issued, most being remelted. The design of these coins was similar to that of coins of the fifth dinar, except that the sixth dinar coins bore the state title "FR Yugoslavia" (SR Jugoslavija in Latin and СР Југославија in Cyrillic). Only one coin type was struck for this short-lived currency, a brass 1 dinar. In 1994, brass 1 and 5 para, and nickel-brass 10 and 50 para, and 1 novi dinar were introduced. In 2000 the word novi was dropped from the currency and new, brass 50 para, 1, 2 and 5 dinara coins were introduced. ^ Judah. The Serbs. Yale University Press. ISBN 978-0-300-15826-7. ^ Cuhaj, 2010, p. 1255. Cuhaj, George S. (2010). Standard Catalog of World Paper Money General Issues (1368-1960) (13 ed.). Krause Publications. ISBN 978-1-4402-1293-2. Pick, Albert (1996). Standard Catalog of World Paper Money: General Issues to 1960. Colin R. Bruce II and Neil Shafer (editors) (8th ed.). Krause Publications. ISBN 0-87341-469-1. Wikimedia Commons has media related to Money of Yugoslavia.